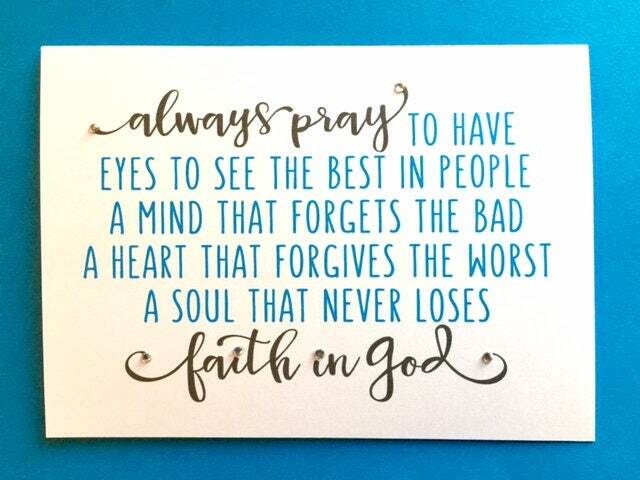 This Always pray card is also a gift and a 5 x 7 print that could be framed; This is an easy way to encourage someone you love with a thoughtful gift she will cherish. This card is one of our customers' all time favorite quotes. This inspirational faith based card is a new design of ours;I've missed making greeting cards, which is what I created primarily when I first opened my shop 8 years ago. So, I'm offering a few of my (and my customers')favorite designs, for a limited time, in some of my customers' fav colors.. Your card, in this same design, style and colors shown will come with a white envelope, blank on the inside, ready for you to sign and send. Or purchase a frame and give it to him/her already framed. Please allow about 2 weeks for me to get your card/print made and shipped. If you'd like more than one of these cards, message us here and we'll set up a listing with savings on combined shipping. Each 5 x 7 card is blank inside and comes in cello bag with white envelope. Very lovely card and very good quality. Thank you.